Anthony Pearson is not an action painter. At least, not in public he isn’t. He has, however, made a number of art works that resemble miniaturized black and white photographic reproductions of archetypal Abstract Expressionist canvases – hints of Franz Kline here, Helen Frankenthaler or Robert Motherwell there. His work is rapt in conversation with the art of the past. 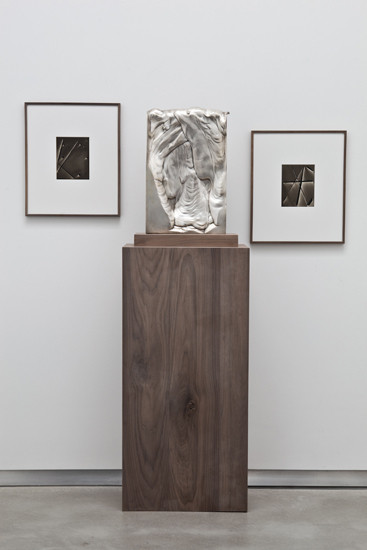 Taken in its entirety – not just photographic prints but gloopy bronze obelisks, dark tablets cast from clay and more – it comes into focus as a taut matrix, extending in unexpected ways from the ‘four-sided arena’ of Pearson’s personal and professional rôle as an artist living in Los Angeles. Pearson trained as a photographer in the 1990s. At first he took pictures of people, then places with people in them, then landscapes without people, then landscapes depicted almost entirely in silhouette, then the sky only. He was looking for ways to make a photograph that asserted itself as a singular object, that was no longer washed in the same churning ocean as every other photograph ever taken. He would wander, alone, in landscapes that seemed to him freighted with atmospheric significance. He was always disappointed with the pictures that he took. He rented a 500 mm telephoto lens in order to take photographs of the sun. One long exposure was so intense that it burnt a hole in the interior of his camera. 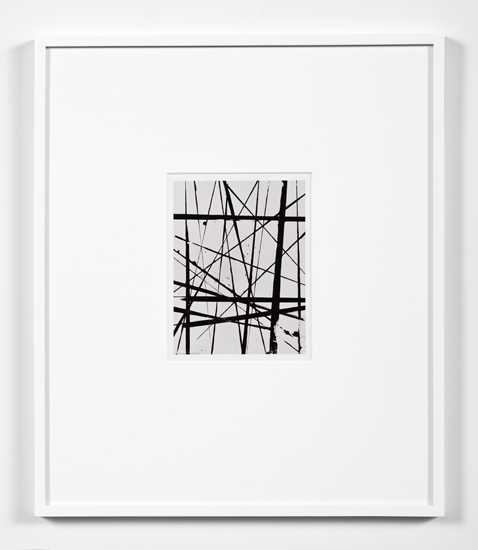 Pearson’s prints are always the same size – six by four-and-a-half inches, mounted with wide borders in wooden frames – and, aside from a few early experiments, are all black and white photographs of gestural paintings he has made, usually on pieces of aluminium foil. Sometimes he solarizes the prints in the darkroom, an unpredictable process that involves flashing the unfixed image with light in order to tonally reverse areas of white and black. Each print is untitled and unique, and the original foil paintings are destroyed. These photographs are distant and detached artefacts: each seems to possess a dim memory of wild energy and fast movement but their deadened, silver gelatin surfaces make it hard to parse their original materiality. Sometimes, an impression in the photograph of the crinkled metal survives, or a dark dribble attests to the fluidity of paint. In others, texture evaporates into a dreamy softness that recalls the photograms of László Moholy-Nagy and Man Ray. Pearson refers to the untitled prints as ‘solarizations’.2 They comprise the first strand of what he now considers his mature work, though they were not alone for long. Dwelling on his original intent to make abstract photographs, he retrieved the negatives exposed in the sun-damaged camera, and used them to make digital scans. The resulting ‘flares’ (again, Pearson’s terminology for the untitled works) are both contradictory and sympathetic to the solarized prints. Contradictory because, while the latter are small, intense and gestural, the ‘flares’ are large, minimalist and somewhat vapid. They have been described by some commentators as reminiscent of the sun when obscured by ‘June Gloom’ – hazy white discs burning through fields of flat black or grey.3 This is also what relates them to the solarizations: both strands of his practice acknowledge the fundamental role of the sun in the photographic process. Like much of Pearson’s work, they are talking about something that is very, very far away. Pearson does, he admits, make abstract paintings in his spare time. He uses his mother’s garage, near his house, where nobody is allowed to enter. This is a hobby, not work, he insists. It is only possible because when painting in the garage he does not fret about issues to do with authorship – ego, originality, possession and so on. Art is so embarrassing, he says. His studio, by contrast, is a calm and orderly space, with a desk and a sofa and diffuse natural light, where visitors can be accommodated and work viewed in comfort. When asked, he declines to describe the paintings made in his mother’s garage. The closest things that Pearson makes to abstract paintings he calls ‘plaster positives’. These objects consist of wooden frames, approximately 1.5 × 1 m, into which are poured shallow puddles of Hydrocal plaster. By tilting the frames he makes soft white slumps, some immaculately smooth and others wrinkled like old skin. Their surfaces are impossibly sensitive to the effects of changing light, which filters into Pearson’s studio through a large roll-up door. These are the only works of his that are constituted by their primary marks and forms; every other element of his oeuvre – including, of course, his earliest photographs – is an indexical print, cast or trace of something else. His ‘tablets’, for instance, began life as clay panels the same size as the small ‘solarization’ prints. Pearson made indentations on them in a comparably instinctual manner to his method for painting on the foil sheets. Most were discarded, but the best were cast in dark bronze and polished to a smooth, indeterminate finish, looking like slabs of toffee. They were a means for Pearson to extend the physical presence of the prints and, conversely, to encourage viewers to think of wall-mounted metal objects as pictures. Silver gelatin prints, after all, consist of various densities of metal; the silver is thickest where the image is blackest. As Pearson became more experimental with ways of assembling these clay tablets – in particular, by using strips of clay in stacks or grids – he drew out the kinship of the process with drawing. 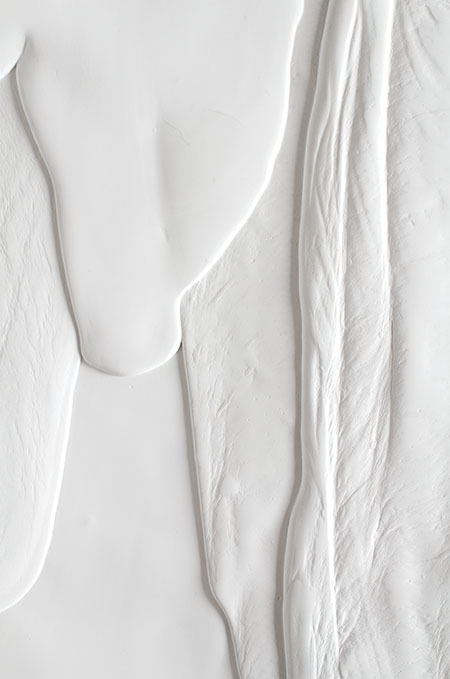 The final sculptures outgrew the proportions of the solarization prints to become lines themselves, such as the tall, spine- or zipper-like objects included in Pearson’s solo exhibition at the Contemporary Art Museum, St. Louis, in 2012. It doesn’t really matter what Pearson’s work looks like – whether anatomy, landscape or other art. What is most important to Pearson is that it looks mostly like itself; that it is recognizable as being his, and that it fits onto – extending but interlocking with – what he has done before. Pearson talks about his work ‘operating within the same frequency’; meaning arrives not through the objects themselves but through their relation to the whole, especially when that whole includes not only Pearson’s art but the ‘adulterated mixture of his life’. The piece of incidental (yet significant) information most often cited about Pearson is that, when he was young, he bought and sold vinyl records. He learnt to identify collectables and to track down rare ones – sometimes whole collections at a time from people who used to work in the record industry, whom he knew would have been sent limited-release promotional discs. He established a client-base around the world, particularly in Japan. In this way, for a time, he made a lot of money. Pearson admits that he thinks of his work, sometimes, as ‘collectables’, though he hates the term. He knows it makes him sound like a manufacturer of trinkets. This perception is inaccurate, however: the primary collector of his art is Pearson himself. The very best examples – in particular his solarization prints, which he covets above all else – he holds back, keeping the prints in a box at home and occasionally taking them out to reflect on the arc of his progress, and to see whether they’re still good. When he talks about ‘releasing’ particular pieces from his extensive output, his use of the language of the music publishing industry is a red herring. In fact, in this context, the word is a synonym for relinquishing, giving something up – the surrender of something of great personal worth. More than half of Pearson’s work is connoisseurship and self-criticism; he loves spending quiet time alone with it, getting to know these objects that are, at first, mysterious to him. Once he recognizes the pieces that really work, the ones that surprise and delight him, he is reluctant to let them out of the studio. A lesser-known anecdote relating to Pearson’s biography is that his father was a theatrical agent who, early in his career, found gainful employment in regional theatres for silent film actors left high and dry by the advent of the talkies. His most famous client was Buster Keaton; he later represented Cesar Romero and Betty Grable, after Hollywood had stopped knocking so loudly at their doors. In his Los Angeles Times obituary, Pearson’s mother was quoted as saying of her husband: ‘Ben was very good at knowing the territory. He knew what actor would play in the South, in Texas, wherever. Any salesman needs to know his territory.’5 Pearson says it impressed him to see his father creating renewed value for these overlooked figures. Pearson is not in the business of rehabilitating Abstract Expressionism, nor any other movement or genre for that matter. He is not nostalgic; on the contrary, his approach to his career is resoundingly contemporary, especially in its reliance on the advanced development of the international contemporary art market. There is, however, a sense that any single work of Pearson’s is only a temporary stand-in for something else, something withheld or absent, or maybe something lost altogether. 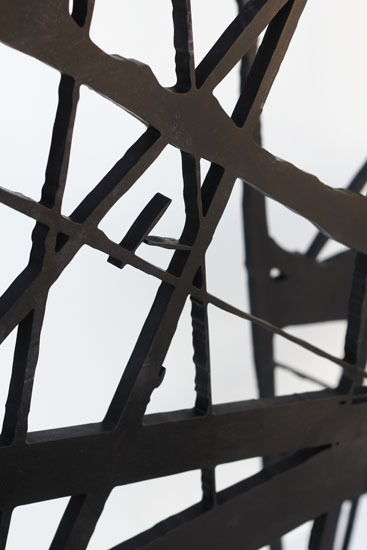 His most physically substantial works to date are the ‘Transmission’ sculptures (2011–ongoing) that he water-cut from sheets of half-inch steel; each stands over two metres high. But even these take their form from Pearson’s solarization prints, which in turn derive from paintings, which in turn come from who knows what sublimated influences and impulses. The ‘Transmission’ sculptures are undeniably elegant and commanding, but no more so, perhaps, than their corresponding solarizations – works a fraction of their size. This surrogacy echoes throughout Pearson’s practice, and leads to the possibility that all these handsome and seductive objects actually only amount to prop stand-ins for a mutually recognizable conception of abstract art. As if a production designer needed some mid-century Abstract Expressionism for a period interior, made some speculative daubs on canvas, and chose the most credible results. That theory is most credible when looking at the ‘flare’ prints; though carefully calibrated and each different from the other, they seem evacuated of authorship, not unlike Cory Arcangel’s ‘Photoshop Gradient Demonstrations’ series (2008–ongoing), colourful prints made by adjusting simple Photoshop settings. The point at which Pearson’s works become thrilling is when they are situated in relation to each other. Why? Because that is when we are asked to look not only at the things themselves but at the spaces between. Within those negative spaces are whole worlds of possibility: the effects of passing light, the movement of our eyes and bodies, the decisions of curatorial display and personal ownership. Ours is an active viewing experience, putting things together, comparing and sizing them up. From there, our thoughts move to the gaps between works present and works absent; in between, we consider the places we find ourselves in: galleries, museums, art fairs or private homes. Nothing is left out of account. ‘The self, terrible and constant, is for me the subject matter of painting and sculpture,’ said Barnett Newman. He probably would not have held Pearson’s evasive and opaque gestures in high regard. ‘The fetish and the ornament, blind and mute, impress only those who cannot look at the terror of Self.’6 He would have been wrong, however. Pearson’s art is absolutely about Pearson the man. And his innovation is in his interrogation of what an artist’s public face might reveal, how he can protect the things that are most important to him – experimentation, innocence, expression, spontaneity – while ‘releasing’ objects that both contain those things and are outwardly cleansed, controlled and suitable for public consumption. Lifestyle is a dirty word, outside of marketing circles, but it has long shaped the activities and production of the avant-garde. As with many more artists than would care to admit it, the form of Pearson’s art is inseparable from the decisions he has made about the way he wants to spend his time, and the things and people he wishes to surround himself with. Nothing less than personal freedom is at stake, and Pearson is amazed and grateful that the contemporary art world allows him to carve out an existence in a space that is shaped for him alone. Anthony Pearson lives and works in Los Angeles, USA. He was the subject of a 2012 solo exhibition at the Contemporary Art Museum, St. Louis, USA, as well as a 2008 show at Midway Contemporary Art, Minneapolis, USA. Recent group exhibitions include ‘Second Nature: Abstract Photography Then and Now’, deCordova Sculpture Park and Museum, Lincoln, USA; ‘The Anxiety of Photography’, Aspen Art Museum, USA; ‘At Home/Not at Home: Works from the Collection of Martin and Rebecca Eisenberg’, Center for Curatorial Studies, Bard College, New York, USA. 2 All quotations from Anthony Pearson taken from conversations with the writer between 2010–12. 3 ‘June Gloom’ is a term for the marine layer of fog that commonly covers the coastal areas of Southern California, especially in early summer.